Valiant Entertainment is bringing back one of their oddest yet entertaining books with Quantum and Woody. The not so dynamic duo of Eric and Woody Henderson have been a staple with Valiant since before the recent rebirth of the company, and have always been fan favorites. Throw in a goat, and you have one entertaining cast of characters. From writer Daniel Kibblesmith (The Late Show with Stephen Colbert) and the ever impressive artist Kano (Daredevil), the book is more of a jumping on point than a relaunch. Eric and Woody were involved in a scientific accident that gave them superpowers. The drawback? Their wrists were fused with metal bracelets that must be “klanged” together every 24 hours, otherwise the duo disintegrates. But the two aren’t on good terms as of late. It seems Eric has been keeping a secret from his outspoken step-brother: he knows who Woody’s real dad is, and where he is. The usually lighthearted tomfoolery of the duo is on hold as Woody falls deep into a plan to take down his brother from a new super powered being. And yes, there is really a goat in this book. Kibblesmith creates a great jumping on point for readers, as Kano creates such fluid and yet frantic scenes that make the book pop. To me, since the relaunch, I have always seen Quantum and Woody as the two main characters to the show Psych. 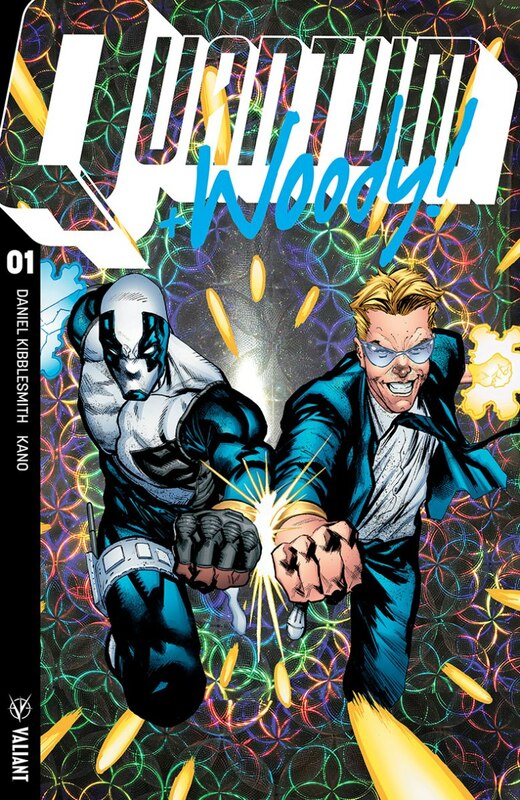 Lighthearted, yet quarrelsome, I would actually pose it to Valiant to snag those actors for the inevitable Quantum and Woody TV series or movie, as the book embodies that buddy comradery to the letter. Valiant has launched another fantastic series here, one where I am along for the ride.